NEWPORT, R.I. - Gov. Gina M. Raimondo – joined by Senate President M. Teresa Paiva Weed, Reps. Ruggiero,Tanzi, Regunberg, Abney, Sen. DiPalma and state Energy Commissioner Carol Grant – today ceremonially signed legislation that will enhance the state's renewable energy policies, create green jobs, and help move the state's energy sector toward a clean, sustainable, reliable future. “These bills represent our continued commitment not only to a more sustainable future, one in which much more of our energy is generated from clean, renewable sources right here in Rhode Island, but also greater investments in creating better career opportunities for Rhode Islanders in the rapidly expanding green industries. Green jobs in Rhode Island grew by 40 percent from 2014 to 2015 alone. Doing everything we can to continue and expand that growth and position our state as a leader in those industries will pay off in the form of well-paying jobs, successful businesses and greater prosperity for Rhode Island,” said President of the Senate M. Teresa Paiva Weed (D-Dist. 13, Newport, Jamestown). “When I led the Small Business Renewable Energy Task Force in 2010, Rhode Island didn’t even have a comprehensive, cohesive renewable energy policy and it was difficult to get financing to build renewable installations here. In just six years, we’ve gone from being a laggard to a leader in renewable energy, and these bills further advance our state’s opportunities for growth in generating renewable energy. With this legislation, we’ve allowed businesses and homeowners to build off-site renewable energy installations, just as municipalities have been able to do for years, expanded the distributed generation pilot program into the Renewable Energy Growth Fund and allowed third-party financing. All of these changes put renewable energy generation within reach for many more Rhode Islanders, strengthening our economy while diversifying our state’s energy sources and reducing our carbon footprint,” said Rep. Deborah Ruggiero (D-Dist. 74, Jamestown, Middletown). "This legislation reflects forward-thinking energy policies that will help us meet our state energy goals," Governor Raimondo said. "With its passage, we can continue to create jobs, connect Rhode Islanders with more cost-effective energy options and reduce our carbon footprint." Also in attendance at today’s ceremonial bill signing was co-sponsor of two of the bills, Rep. Teresa Tanzi (D-Dist. 34, South Kingstown, Narragansett). "I have been at the table for the majority of bills the General Assembly has passed around renewable energy since elected, and I am proud of the standing Rhode Island now has as a result of these efforts." “We are so grateful, not only to the governor and the General Assembly, but to the many stakeholders who have been a part of this process. Our collaborative push to bring clean, reliable, diversified energy to Rhode Island has resulted in substantial progress toward our energy goals. There is much more work to be done, and I am proud to be part of the team that is leading that charge," said Office of Energy Resources Commissioner Carol Grant. The governor and SolarCity National Field Campaigns Deputy Director Christy Plumer also announced today that SolarCity would be expanding operations in Rhode Island. The expansion is in large part due to the work of the General Assembly and the governor to build the clean energy economy – particularly the state’s efforts to expand net metering and allow residents to install solar through a lease or power purchase agreement – as well as the governor’s recent meeting with SolarCity in California. SolarCity operation centers typically have approximately 100 employees when fully staffed. IN PHOTO: Gov. Gina M. Raimondo, seated, signs one of the renewable energy bills. Behind her, from left, are Newport Vineyards owner Paul Nunes , House Finance Committee Chairman Marvin L. Abney (D-Dist. 73, Newport, Middletown), Rep. Deborah Ruggiero (D-Dist. 74, Jamestown, Middletown), President of the Senate M. Teresa Paiva Weed (D-Dist. 13, Newport, Jamestown), Rep. Aaron Regunberg (D-Dist. 4, Providence), Sen. Louis P. DiPalma (D-Dist. 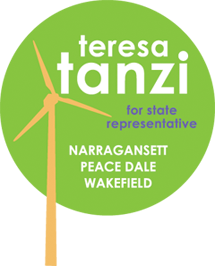 12, Middletown, Newport, Little Compton, Tiverton) and Rep. Teresa Tanzi (D-Dist. 34, South Kingstown, Narragansett).